Born in the Astral Sea: You are considered an immortal creature for the purpose of effects that relate to creature origin. You are considered an angel for the purpose of effects related to that keyword. Divine Body: You gain Resist Radiant equal to 5 + half your level. Divine Mind: You gain a +2 to saving throws against fear powers and have a +1 racial bonus to Will. Meditation: Rather than sleep, Angels enter a restive trance. You must spend 4 hours in this state to gain the same benefit other races get from taking a 6 hour extended rest. While meditating you are fully aware of your surroundings and notice approaching enemies and other events as normal. Angelic Heritage: When your angel character gains a class utility power after 1st level, you can forgo taking a power granted to you by your class. Instead you gain an angel utility power of the same level or lower. Hunter of Evil: You deal an additional 1 damage to creatures with the Devil or Demon keyword. This increases to +2 at 11th and +3 at 21st level. Angels mature at an accelerated rate reaching adulthood at age 12 and are immortal. An Angel's skin tones, eye color, and overall physical appearance often appear to be holy and divine. They are taller than humans however their essence is somewhat lighter. It is not uncommon for Angels to radiate a powerful aura of colored light depending on their mood and seem to be more real than anything around them. Some Angels' auras are so powerful that they convey emotions and so most will learn how to control their aura as children so that they can be more persuasive speakers or stealthier thieves. Most Angels are considered unnatural their entire lives because of their hardly changing appearance after 12 years of age. Angels are rarely found in groups as it is common for them to seek solitude however those who are more extroverted seek out their fellow angels looking for some form of kinship that they never had. Due to the power and rarity of the race, many Angels are kept as personal retainers to nobles and kings, and are frequently used as elite guards. It is not uncommon for a king to hire an Angel as a personal bodyguard, trainer and teacher of the heir to the throne, however the great attractiveness of some Angels results in kings sending them away for fear of losing their Queen. Most Angels find no comfort in their host societies; with few ever truly feeling at home. It is because of this Angels tend to travel, following whatever path they wish, so that can find their place in the world. Some are drawn to divine paths, such as that of the paladin or clerics, while others wish to commune with nature, becoming sages and shamans; though more commonly an Angel will seek to prove themselves in battle and are well represented among the martial classes. Angels are often intimidating to be around and anyone stuck in conversation with an Angel often finds themselves either on the edge of fright or hanging on the edge of the Angel's every word. Angels favor the Paladin, Warlord and Cleric classes. Two sample Angel adventurers are described below. Avengelyne is an angel warlord. She was a feared warrior in Elysium, having single-handedly broken into the outer fortress of the Nine Hells, to confront the devils there. She questioned Pelor's love for humans, so was banished to the material realm and stripped of her abilities. Although he appeared truly angry, Pelor was trying to prepare Avengelyne for a coming war for which she would need to be strengthened. When creating an angel adventurer, here are a few points to consider. To try to prove to the gods that you are worthy of the celestial plane. Fly across the battle field raining down death or healing the wounded. Be a powerful being often feared or revered by the people who raised them. 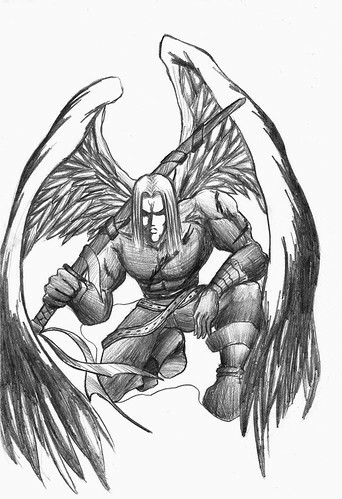 Angel Characteristics: Intimidating, Inspiring, Lonely, Impetuous, Noble, Adaptable. Angelic Presence Your divine presence awes your foes. Angelic Wings You unfurl your wings of pure white feathers. Cloak of Vengeance Whilst you are not bloodied, any creature that hits you with a melee attack suffers 10 cold and fire damage. You raise your palm towards the injured and a white light wafts over to them, knitting their wounds shut. Effect: The target gains hitpoints equal to your Wisdom modifier. You shall not be disgraced: you channel divine energy into your weapon. Requirement: You must be bloodied. Effect: Until the start of your next turn, your weapon attacks deal fire damage and target Reflex if they would normally target AC. Your angelic presence emits pulses of divine energy, deterring foes from approaching your comrades. Effect: Until the end of your next turn you have an aura 5. Enemies treat the aura as difficult terrain. Sustain Minor: The aura persists, as long as you are within 5 squares of an ally and your angelic presence is active.